The Branson area is ideal for outdoor sporting events, both large and small. From Bassmasters tournaments and triathlons to PGA events and youth-sports championships, Branson’s outdoor venues offer the settings and amenities you need to host a fun and memorable event. With three lakes, Branson has you covered if your event requires a great body of water. Table Rock Lake is ideal for bass fishing and water recreation, Lake Taneycomo is a trout-fishing paradise and great for kayaking, and Bull Shoals Lake makes a great destination for events involving scuba diving and fishing. Table Rock and Bull Shoals were recognized by Bassmaster Magazine as being among the Top 50 Bass Lakes in the U.S. for both 2012 and 2013. Branson’s lakes have hosted events such as the Ironman 70.3 Triathlon and King of the Wake, an elite pro wakeboarding tournament. Easy and convenient access to these lakes makes them ideal for hosting events. Branson is known as being home to some of the best golf courses in the Midwest and you don’t have to take our word for it: in 2012, Golf Magazine and Golf.com both listed Branson as being among the Midwest’s Top Summer Destinations. Also, Golfweek Magazine listed four of Branson’s courses among its “best of” list for public courses in the Show-Me State. Most recently, Branson and its fun, challenging courses grabbed the spotlight at the first-ever Big Cedar Legends of Golf Tournament, an event on the Champions Tour (Senior PGA). The you’ve-got-to-see-it-to-believe it Top of the Rock and newly named Buffalo Ridge (formerly Branson Creek) served as tourney hosts. Looking to tee it up with a memorable tournament? Let Branson’s courses and knowledgeable staffers help you out. Home to more than 200 miles of publicly accessible trails, Branson has ample options for your cross-country event, whether it’s for runners, hikers or mountain bikers. If you’re looking for a challenging trail, check out the 3.4-mile Homesteader’s Trail at Ruth and Paul Henning Conversation Area, located west of Branson. Or check out the 2.25-mile Lakeshore Trail, open to both hiking and biking, in Table Rock State Park. And don’t miss the five-mile Murder Rock Trail (it’s not that bad, we promise), though it does have some difficult side trails. Branson’s Parks and Recreation Department manages 16 parks with a variety of amenities for your group sporting event. 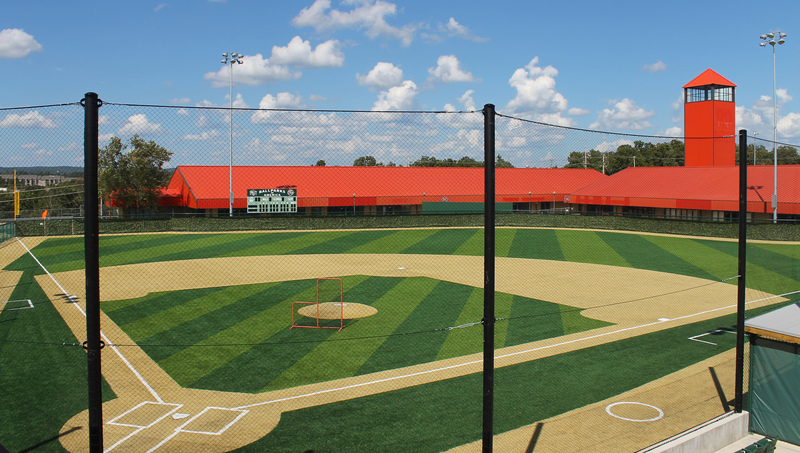 Among those facilities, is the versatile Branson Rec Plex that consists of both a 44,000 square-foot indoor facility and an incredible 42 acres of baseball, softball and soccer fields, two gymnasiums, a three-lane indoor track, and plenty of seating for spectators. The Rec Plex has two 200-foot fields and two 300-foot fields. Its sister facility, the Branson AquaPlex includes an aquatic park and pool that includes six lanes for competitive swimming events. The Rec Plex has been home to over 300 state and regional events. Ballparks of America features premium synthetic turf fields and MLB style team suites. It is the only facility in the world to feature 2/3 replicas of 5 of the most iconic stadiums - Wrigley Field, Tiger Stadium, Busch Stadium, Ebbets Field, and Fenway Park.